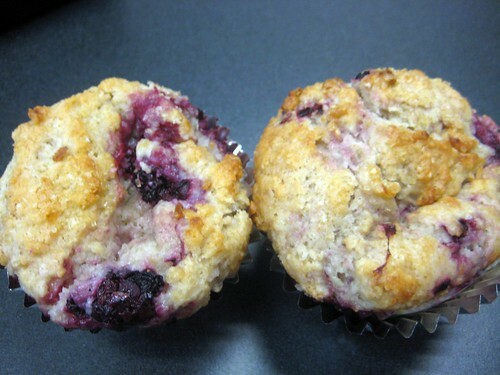 Folks, I'd like to introduce you to the result of last night's relaxing evening in: Marionberry Coconut Muffins based on the Bakery Style Berry Muffins in Vegan Brunch. Their birth, er baking, topped off my first night home in a long stressful and glorious while delightfully. I started with a ton of housework, embarked into Season 3 of Dexter, hung out with my cats and hit the sack by 10pm! Did I mention delightful? I'm well rested! These are made with hand picked marionberries I had frozen, lite coconut milk (leftover from a tester for Isa's in-progress 'healthy' cookbook! ), almond extract and the addition of 1/4 cup of shredded coconut flakes. I used my 'big' muffin pan, a hand me down from the wonderful Julie Hasson, to bake them in. Shockingly enough, I never made these during the Vegan Brunch testing last year, but feel free to check out my ultimate testing post here if you're interested in what I did make. those look SOOO good! I love the touch of coconut! Coconut ANYTHING is good! And those look amazing. Those look delicious! And coconut makes just about anything even yummier. I looove vegan brunch (especially the omelette) but I haven't tried the bakery style muffins yet. Yours look so amazing! I'm eating some oatmeal for breakfast right now but kind of wish I had one of these instead. You Portlanders and your Marionberries......they're gorgeous, Jess! i could totally go for one of those right now. i've never had marionberries though. sounds yummy! Yum! I've never even heard of marionberries, but I'm down with all berries, so I'm sure marionberry and I would be fast friends...especially if she was hanging out with my best bud coconut.